Was it a meaningful move, or just noise? 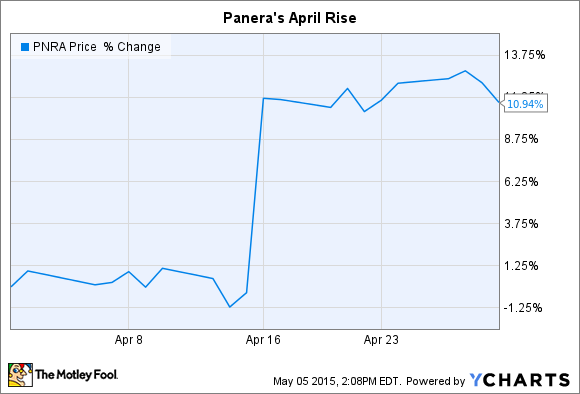 What: Shares of bakery-cafe operator Panera Bread (NASDAQ:PNRA.DL) rose 11% during the month of April, according to S&P Capital IQ data. So what: The stock popped in response to an April 15 press release that announced a step-up in Panera's capital return program. Management now plans to spend $500 million over the next year repurchasing the company's shares, for about 10% of the existing stock pool. The new buyback plan represents a major acceleration from the $154 million that Panera spent on repurchases last year. The company plans to fund the spending through additional debt. Second, management announced that Panera has sold 73 of its cafes, quickly exceeding the low end of its target range of refranchising between 50 and 150 stores this year. These sales will boost profitability. And third, management appears to be considering additional shareholder-return-focused changes in the months ahead. Panera said in the press release that it is in "constructive dialogue" with activist investor Luxor Capital Group regarding the goal of "delivering value." Now what: While it's nice to see growing cash returns to shareholders, none of these announcements hit directly on Panera's business. And to get that back on track, CEO Ron Shaich and his team are focusing on improving the customer experience through things like menu, store design, and marketing changes. Investors will know those upgrades are working when the customer traffic turns solidly higher. But that hasn't been the case so far. Panera's first-quarter results included a scant 0.1% gain in transaction volume as its 1.5% comparable-store sales gain was entirely powered by higher menu prices.